With 5pm automatic reminders you will not miss your deadlines. 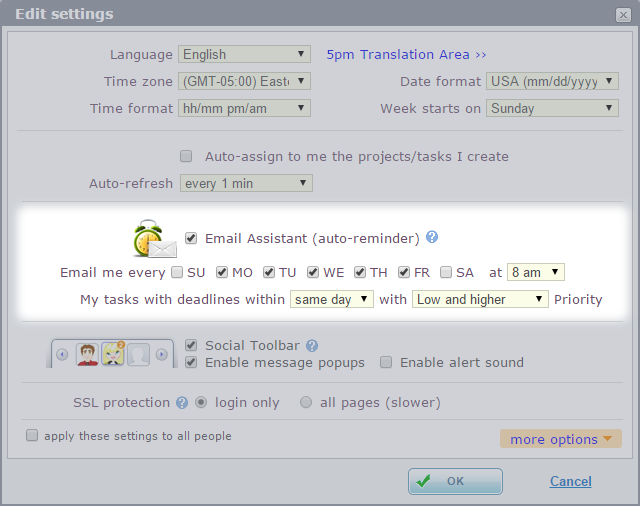 When you turn on the Email Assistant (through the Settings window) 5pm will start sending you automatic emails with the list of tasks that have to be completed soon, plus the list of the overdue tasks. You can configure things like on which days to receive the emails, how long in advance before the deadlines, etc. This in an individual setting and has to be enabled by each user. 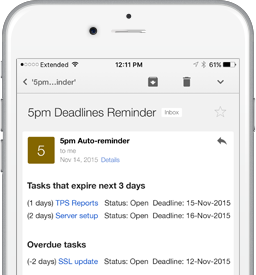 The simple email-reminders format makes it easy to read them on mobile phones.